Diet Coke is celebrating fun, fashion and fabulousness with Eleanor, Bernadette & Irene, girls who ‘Love It Light’, in a new television advertising campaign launched this week. 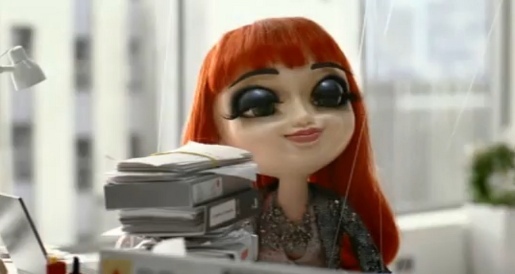 Eleanor, the marionette associated with Diet Coke’s sponsorship of Ugly Betty in 2009, is shown with her friends working at a fashion magazine. Just as the clock strikes 5.30pm, their boss drops a mountain of work onto Eleanor’s desk. As Eleanor sighs, her trusted friends rally round and instantly know it’s a moment to lighten up and enjoy a diet Coke. The campaign was launched on March 14 in Great Britain and will continue in Europe, Australia and New Zealand. The three Love It Light girls will appear again in a series of ten second blipverts, showing from late April. The push will be supported by a Diet Coke Facebook hub, a year-long partnership with online fashion retailer ASOS.com and a tie-up with Kiss radio. The Maniac campaign was developed at Mother London by creatives Susan Hosking and Peter Robertson, and agency producer Angela Eleini. Filming was shot by director Traktor via Partizan with producer David Stewart and director of photography Stephen Blackman. Editor was Rick Russell at Final Cut. Post production was done at MPC. Audio post production was done at Factory Studios.